These mini-roll-on bottles caught my eye not too long ago, so I ordered a couple – just to see if they were anything that might prove useful. For years, finding new containers would get me so excited I would create a new formula for the bottle/jar/spray dispenser before actually seeing it. And on too many occasions, it would be a disappointment to discover the overall look was too bulky/dainty/opaque/clear for the product I had in mind, or the dispensing system just didn't suit the texture of the product I wanted to fill it with. I've learned by now to just place a sample order of any containers that look interesting, then see if they 'speak to me' when I have them in hand. These mini-roll on bottles didn't just speak, they came out of the package shouting EYE SERUM!! (If you were here, you totally would have heard them too). Before I had even finished unwrapping the first bottle, I was busy working on formulating the contents for it. This brand new eye serum is a mix of soothing cucumber extract, plumping hyaluronic acid, and firming caffeine in a calming aloe vera gel base with a splash of rose hydrosol to add a delicate scent and extra moisturizing action. It's basically all of my favorite actives for the eye area – all rolled in to one roll-on. The extra bonus has been discovering how pleasant it feels to apply an eye product with a roll-on – clean, concise, and, well... comfortable! Here's a snapshot of the first batch with label. 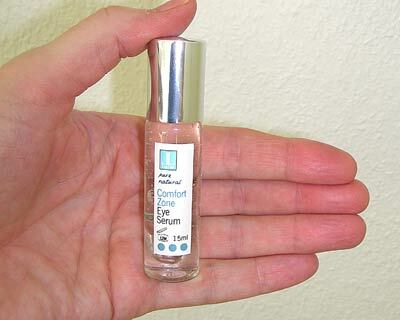 The name: Comfort Zone Eye Serum. 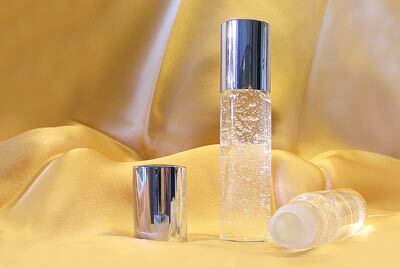 Even though this bottle fits neatly into hand, pocket, or purse, it holds a pretty generous 15ml. Testing is underway and my initial impressions of both packaging and contents is very promising. Have you ever tried an eye product that rolls on? What did you think of it? Den er da lige i øjet til "morgenøjne". Hvis du får positive tilbagemeldinger på den, kunne den meget vel komme til at afløse min "Mellisa" morgen øjengelé. Det lyder da lovende Rikke! Den er i hvert fald kølig og rart at påføre om morgenen, og jeg må sige at den ikke engang 'genere' make-uppen der kommer på kort efter..